Blogging about events that contribute to the Earth's climate. How much methane does a cow actually produce? Cows are notorious for the amount of methane they produce. Methane is a powerful greenhouse gas (GHG), but just how much do cows actually give off and how does this compare to other methane emission sources? This post tries to give an overview of all things methane and cows..
Where does the methane come from? The plant diet of cows and other ruminants is high in cellulose, which cannot be digested by the ruminant itself. However, ruminants have a symbiotic relationship with colonies of microorganisms, called methanogens, which live in their gut and break down the cellulose into carbohydrates.. These carbohydrates provide both the microbial community and the ruminant with an energy source. Methane is produced as a by-product of this process. A common misconception is that the cow’s rear end emits methane, however the vast majority is released orally. Researched carried out by Grainger et al. in 2007 found that 92-98 % was emitted orally (I won’t go into detail about how they found that out!). It is also wrong to think that all bovines emit the same amount of methane but I will go into this in more detail later on in the post. Global emissions of methane were estimated to be between 76 – 92 Tg per year (1 Tg = 1 million metric tonnes). This is roughly equal to ~10-15 % of global methane emissions, which in turn is ~15 % of global GHG emissions. Methane is a more potent GHG than CO2, which means that gram for gram methane warms the atmosphere more than CO2. Methane also has a much shorter lifetime in the atmosphere compared to CO2 (~10 years compared to 100s of years) which will produce more rapid impacts on the global climate. This also means that any reductions in methane emissions will see a faster decrease in atmospheric concentrations than compared to CO2. The table and figure below compares farmed animals in the UK and their contribution to methane emissions per animal per year in kilograms. A dairy cow emits over twice the amount of methane than a beef cow and is by far the highest contributor of all the animals studied. There are also more dairy cows in the UK than beef cattle (1.81 million compared to 1.66 million). All data found from the UK GHG Inventory report 1990-2012. Other research has shown that cows emit methane at regular times of the day, specifically during feeding and milking. Although these figures do not take into account farming and transport GHG emissions and the actual amount of milk each animal produces, perhaps it would be better to buy goat milk? Although the more preferable metric of Carbon per Litre would allow a more concrete conclusion on this point. Future methane emissions are almost certainly expected to increase due to global food demand increasing from population growth. Developed nations also consume more meat, developing nations are thus expected to increase their meat consumption in future years. Methods to reduce methane emissions from cows are summarised in the table below (taken from Reay’s book Methane and Climate Change). These have been classified into short term (available now), medium term (available in ten years) and long term (not commercially available for at least another ten years). Many of these suggestions have been disputed as they are not economically viable, especially in developing nations. An alternate pathway would be to try and capture emissions from cows. A dairy cow can produce up to 400 litres of methane per day! When burned, this is enough energy to power a small fridge for a day. 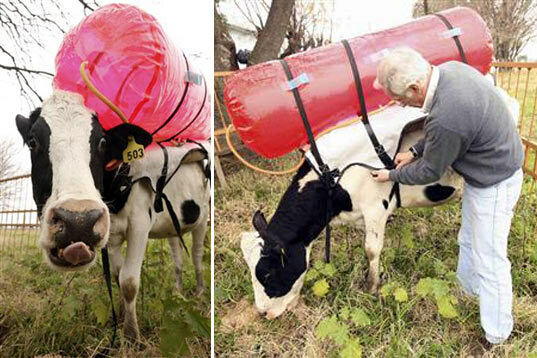 Some scientists have harnessed methane emitted from cows in backpacks (see photo and video below) however scaling this up to all 10 million cows (this includes all calves, young bulls etc in the UK alone) could be problematic! If you have any questions concerning this post please ask in the comments below! This entry was posted in Chemistry, Climate Science, Global Warming, Media and tagged cow burp, cow fart, cows, GHG emissions, Greenhouse gas, how much, how much methane do cows produce, methane by connorsSL. Bookmark the permalink. May I use your photo of the cow/backpack? Hi Cynthia, I got this image from the BBC webpage I link to above (maybe I should make this more clear). The photo has also been used in a few websites including here. Yep, I got the information for this blog post from these sources: Methane and Climate Change (book by Reay), the UK National Inventory report on methane emissions, the scientific research paper by Grainger (2007), and the BBC article I link to above. Great article! but instead of using goats milk as an alternative, why not give animal milk a miss altogether, there is also soy milk, oat milk, almond (or other nut) milk(s), rice milk, hemp milk, coconut milk, or no milk….? better for the planet, better for your health and better for the animals! Thanks. Nope, cold milk for me! Very nutritious and one of the most efficient foods out there, whether you measure it be a pound of feed to pound of milk conversion basis, or calorie of feed to calorie of milk basis. I think I’m going to go drink a tall glass right now! At the end of the day milk as we know it would be considered delicious and healthy because it carries “calcium” . Well news flash we barely absorb any of the calcium it says it has. And just to add on the the terrible things cows milk will and will always be calf growth hormone. All mammals who eat vegetables give off methane. The problem with the cows is the crap food they are fed. Corporations feed the cows food that is very hard to digest. It sits in their digestive tracks and practically ferments giving off lots of methane gas. It’s not the cows fault, it’s corporate food companies. Cows should be allowed to graze and NOT fed corn, rye, etc. Hi Deborah, Thanks for your comment. Mammals will produce methane if they have the certain type of bacteria present in their stomach – most do. What each animal eats definitely changes how much methane is produced. Studies have shown that cows eating grass produce less than eating grain, but a lot of methane is still produced. The best way to reduce methane emissions would be to decrease the amount of meat and dairy we consume so less animals are farmed. Thanks again for reading my post! In order for this to work, the root cause (the methanogen organisms) would need to be eradicated from the Earth. They pre-date cows, and will continue to exist, and ferment dead vegetable matter all over the planet, whether there are cows or not. Many if not all ruminant species can support these organisms. Even omnivores, including people host methanogen organisms! Yes, not only that, methanogens exist in nature whether there are cows present or not. In an anoxic (no oxygen) environment these will ferment ANY dead cellulose-bearing vegetation and produce methane. Those focussing on cows seem to conveniently ignore the fact that these organisms, while symbiotic with cows, are not dependent on them for their existence. Many of them live in the ocean, for example. Any sensible analysis of this phenomenon must take in to account the amount of methane produced due to methanogens in cows vs the amount produced by all other methanogen action. Not only all mammals, but all instances where methanogen bacteria are actively breaking down cellulose (any plant matter) will produce methane. The fraction of plant matter turned to methane inside cows vs the fraction consumed by methanogens in the environment at large is a very important factor. How do we stop the grass that the “reduced” (no longer present) cow would have eaten from dying, decomposing and generating GHG all by itself? There is a lot of grass in the world. It ferments when it dies. Methanogens can exist whether or not cows exist, and have been on Earth longer than cows. They are also heartier than cows, living almost anywhere oxygen is scarce and food exists. I am a computer science graduate. I want to do my research work. I came to kn that we can find problems in veterinary field for which i can use hardware and computation for solving problems. Can u suggest me some real time problems for which we can find a solution. Hi Barrett.k, the photo is sourced from the link in the caption, so if you use it make srue you credit the article. If you mean the infographic then that is freely available to use, it was made by my friend @oatjack. I heard about research in India claiming Indian Humped Cow (Popularly called Desi Cow) gives out much less Methane than European Cows. Can we use the methane gas produced by dairy cows for some other purposes like fuel etc. Why, in those farms that methane is not caught and used. Don’t know about amounts …. anybody ever studied on oxygen inhale by such animals like dairy cow, goats, chicken etc?? If cows give off most methane when being fed or when milked then why isn’t this done in a customised tentlike structure to capture and store this usable gas? I’m a random person(don’t judge, that didn’t sound weird in my head…) and I just want to thank you all for putting all, this effort into making the world a better place and informing the public(or at least trying! ), so thank you! Also, I’m doing a school project about cows and their emissions of methane and you guys helped a lot! Don’t worry, I did source you! Will you think about adding humans to the infographic so we have a visual comparison between humans and cows? Thanks! Rough calculation; if all cattle in the world (ignoring other ruminants which also produce methane) produced about 5-6 times the methane that people did, they would win. They would definitely produce more than people, but how much more? Anyone game to strap-on one of those flatulence backpacks? But even if all ruminants, and all people were culled from Earth, the methanogen organisms would continue to exist and produce methane. They may like us, but they don’t need us.